The ancient civilizations of Mesoamerica developed complex calendar systems based on overlapping cycles of time. The Aztec Calendar Stone is a symbolic portrayal of the four disasters that led to the demise of the four prior Universes in Aztec cosmology. It also contains a hieroglyphic and pictographic layout of how the Aztecs measured time. The stone has both mythological and astronomical significance. Historically, the Aztec name for this monolithic time keeper is Cuauhxicalli ‘Eagle Bowl’, but it is universally known as the Aztec Calendar or Sun Stone. It was during the reign of the 6th Aztec monarch in 1479 that this stone was carved and dedicated to the principal Aztec deity: the sun. This 15th century monolith was carved from a piece of basalt weighing 24 metric tons, forming a disk approximately12 ft in diameter and 4 ft in thick, which depicts sun gods at its center, representing present and past eras. The suns are encircled by several segmented rings, some with hieroglyphs, showing the divisions of Aztec cycles of time. On December 17th, 1790 the stone was discovered, buried in the "Zocalo" (the main square) of Mexico City. The viceroy of New Spain at the time was don Joaquin de Montserrat, Marquis of Cruillas. Afterwards it was embedded in the wall of the Western tower of the metropolitan Cathedral, where it remained until 1885. At that time it was transferred to the national Museum of Archaeology and History by order of the then President of the Republic, General Porfirio Diaz. The original basalt version is presently on display at the National Museum of Anthropology in Mexico City's Chapultepec Park. Like the Mayas, the Aztecs counted time in years of 365 days based on the solar cycle, and a religious year based on the 260 days cycles of the planet Venus. The solar calendar of 365 days, called "Xiuhpohualli", the Vague Year, was composed of 18 "months" of 20 days each, called veintenas, divided into four five-day weeks. A period of 5 days was added at the end. The 360-day period was called "Xihuitl" by Aztecs, and "Haab" or "Tun" by the Maya. The final unlucky days, or days of nothing were called "Nemontemi" days in Nahuath, and "Uayeb" in Mayan. This was a time of festivals. Though both calendars inter-relate in religion and ceremony, it's the tonalpohualli that is considered the sacred calendar. The rituals were all divided up among the gods. This solar calendar was inseparable from the Sacred Round, or Sacred Almanac. 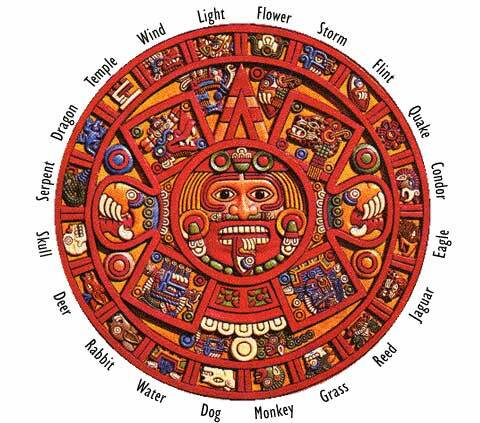 The priests used this ritual calendar of 260 days, called "Tonalpohualli" by the Aztecs and "Tzolkin" by the Maya, primarily for divinatory purposes and was broken up into 20 periods, each containing 13 numbered days, called trecenas. The numbers 1 to 13 were also personified as the heads of the gods they represented. This period of 260 days also constituted the divinatory or ritual calendar, known as "Tonalamatl". The formula by which the two calendars were combined meant that no one date would be repeated for a period of 18,980 days. Thus the last day of a solar cycle and the last day of a sacred cycle coincided just once every 52 years. The face of the stone contains various mythological and astrological figures and signs in geometrical order. The outer border contains two serpents meeting face to face at the lower extreme, which is believed to represent time and the chief Aztec gods. Their tails are joined at the top with the symbol for the ritual date 13-Reed, considered to represent the creation. Within this border are the rays emanating from the central figure, which represents "Tonatiuh," the Sun god. Tonatiuh’s tongue is in the form of a sacrificial flint knife, protruding from between his bared teeth, while in each claw-like hand he grasps a human heart. Surrounding the central sun figure are seven rings of varying dimensions. 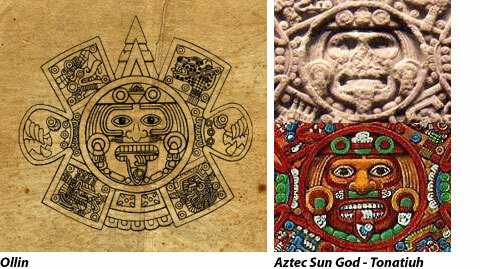 Above the face of the Sun god is an arrowhead symbolizing the wind. The god is surrounded by four glyphs symbolizing the four elements, air, fire, water, and earth and the cataclysms that ended each of the prior solar eras. According to Mexican belief, earth's earliest inhabitants were devoured by jaguars. The demise of the second sun brought destruction by great winds. The third sun ended with fiery rain, while the fourth sun was extinguished by massive floods. These symbols, together with the image of Tonatuih (Aztec Sun God), are neatly contained in the abstract motif for motion called Ollin. 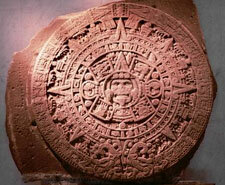 It is thought that the stone reveals the predicted date of destruction for “del Quinto Sol” during a 4-Ollin cycle. It is believed we are currently living in the Fifth sun, an era of decline. In this present era, creatures on the earth suffer continual hardship and testing by the gods. Any species, which fails these tests, is doomed to perish and to return to the sun from where it came. This sun too will die, unless mankind climbs the ladder of redemption, which is represented in the names of the twenty days of the calendar. The ultimate aim of creation is a regenerative process by which mankind redeems itself. It is thought that if this goal is not achieved, the world will be destroyed to start yet once again.